For the Panasonic device there wasn’t and the Intermec plugin was not compatible. 🙁 Based on the Intermec plugin I started creating a plugin for Panasonic. Besides Android there were also Panasonic devices running the Universal Windows Platform (aka Windows 10). Also for these devices I needed to create a Laser Barcode Scanner plugin. For the Panasonic devices I’ve created one plugin that can be used for the android version as well as for the UWP version. I will only explain the most time consuming parts of creating my own plugin. In my plugin I’ve created an action “activateReader” to activate the Laser Barcode Scanner. 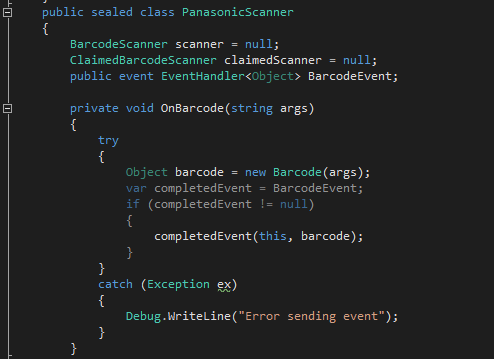 This function will keep the callbackContext in a private property so I could use it when a barcode is scanned. The “onRead” function is the callback function of the scanner. Which means that every barcode scan will execute this function. This part took me most of the time. Returning a result of the scan was easy but this only worked once. 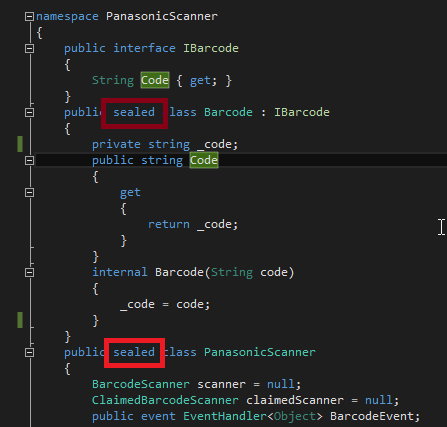 After some research I figured out that I had to turn the keepCallback property to true. With this property I could return as much barcodes to the Fiori app as I wanted. Besides the Panasonic device running on Android I also had to support Panasonic devices running on the Universal Windows Platform (aka Windows 10). After a long way of research and trying I completed the Laser Barcode Scanner on Panasonic devices for Android and Windows. Did you create the plugin for the Panasonic FZ-X1 running in Android 4.2.2 or 5.1.1? Your Plugin worked on my device with 4.2.2, but not after upgrading it to 5.1.1. Do you know if there is any issue after upgrading the device? great work! I read the solution youve built. I am working on a task where a similar challenge lies. Would it be possible to hire you for this job? I write the notes in Dutch …. We hebben nu een klant die Panasonic Toughpad op Windows gebruikt waarmee het mogelijk is Barcodes te scannen. Met de Native camera werkt het goed maar er is ook nog een InfraRood-scanner hardwarematig aan boord. Is het mogelijk om via de route Cordova dit stuk HW eveneens te gaan benutten? Ik begrijp dat ook hiervoor een zogenaamde ‘bridge’ nodig is, we hebben gezocht naar nieuwe add-ons, momenteel zijn die niet voorhanden. Is het mogelijk: voor onze klant / voor de community binnen Cordova (Apache) kan in Java, C# of .Net een zelfde soort bridge te bouwen? Kunnen we voor het bouwen van deze bridge een offerte krijgen? Wij hebben momenteel binnen Techedge Duitsland onvoldoende JAVA dev. capaciteit om dit te realiseren. Een klant van ons heeft verschillende van deze Toughbooks en wil graag aan de slag met de InfraRood scanner. Reply in German or English is OK for us. thanks for the great post. Is there an option to add custom cordova plugins to the SAP Cloud Platform Mobile Services based build of the Fiori Client ?